Discussion in 'Monetisation' started by Andrew Wright, Apr 2, 2018. Missing the Domain Shield and Drop Hidden bid formats and to be frank, I'm not bidding any more - I'm not going to flag domains for others to pick up. I'm also not in a position where I can try to snipe a bid at the last minute - real world demands on my time. Still picking up domains, but as registrations. Thanks for the feedback Andrew. I am also curious to know if anyone else has thoughts on this. Scott7 and Andrew Wright like this. I would like to see auDA run the official daily drop auction and for them to monitor bidding to make sure it is legit and no Shill Bidding etc. auDA can use the revenue to lower .au wholesale pricing and their own auDA / auDA Foundation compulsory fee's they charge. People can have some reassurance the highest bidder will get the dropping name without multiple platforms. With the auDA PRP suggestions and comments from Sydney and Melbourne meetings I have not bid on any drop auction since. They where very clear about the cut off date of 2016 etc. Anyone who heard the full PRP Meetings should also note this major issue. They may have changed their mind since but we have not been told nor has the general public. In my opinion it is too risky to bid on any dropping .au name for any serious price due to the uncertain eligibility rules for the proposed competing additional .au domain name extension. It is looking more likely the proposed competing .au will not even go ahead now. auDA just needs to make that announcement to stabilise the existing .au name space and all market values. More people will then start bidding on the existing .au domain name options via aftermarket, drop auctions and new hand registrations. I do not like the multiple platforms, running concurrently.. reminds me of the Snapnames/Namejet saga, missing out on domain drops, even though they are the same company. I miss the simplcity of the DomainShield bidding system. I still place blind bets on NetFleet, although I dislike their bidding format, I usually bid the minimum. Drop is the only one I actively watch and bid on. I would prefer one platform, preferably run by a goverment body, that verifies and checks the eligibility of valid bidders. auDA use revenue to lower wholesale prices? Are you kidding, they recently announced that they plan to more than double their fee for domains moving forward by only offering a 10% decrease in wholesale pricing. What better time to buy than when all the pessimists are shouting that the end of the world is coming. Prices are very low right now and on a fair auction platform like drop you are literally able to pickup bargains at the moment. I also wish they would make some sort of an announcement if they have changed their minds as the indecision is not good for the aftermarket. The publicly available information at the moment still indicates that the PRP has not been stopped yet and they are still considering the HOW of introducing direct registration. It would be hard to prove a devaluation of the $10 per year registration fee which they are responsible for. What you seem to be alluding to is that you think they have a responsibility to protected the perceived resale value of domains we own. It would be awesome if they where responsible for that as I'd be knocking on their door for failing to protect the aftermarket from harm. I don't think it works that way. I have tried to minimize the number of platforms so we are now back down to just two, hopefully that helps a bit. We do check the eligibility and validity of bidders at drop (and also used to at Domain Shield) if anyone has an issue with bidders not being eligible or even valid feel free to PM me or even SMS me details and I will investigate them for you. 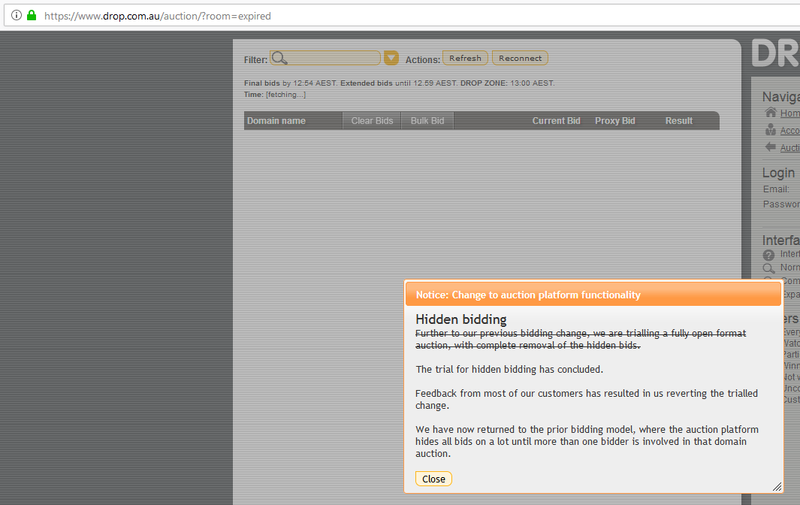 The problem with auDA running it would be a lack of oversight. Who would you complain to if you thought something was amiss? Right now if I was to do anything untoward, you can simply call up auDA and a world of hurt would rain down on me. If auDA ran the drops you would not have anyone to report problems to unless you are patient enough to wait for the next government review in order to give feedback. With auDA running an Official drop platform there is the ACCC, Fair Trading, DoCA etc. When more of a push is needed they would need to be far more accountable than they may have been to date. It would be better for bidders / consumers to know the highest eligible bid got the name and the income generated goes towards management of the .au name space. That extra income could be listed on auDA P and L etc and yes people should make sure it was not wasted. I miss the $1 hidden bid on Drop. Okay - I've got some competition in domains that drop right through. Today 2 ended up being registered through Uniregistrar Corp and 1 via Web Address Registration. @Drop.com.au @DomainShield - Time to return hidden bids? Under current policy your're currently flagging domains for other to pick up at netfleet, and missing out on some registration margin - as opposed to no margin when PPL handreg domains that drop right through at other registrars. Thoughts? Has the no hidden bids policy driven extra revenue at Drop.com.au or less? Andrew Wright and Scott7 like this.